Published in Nature, researchers at the University of Sheffield led by Dr. Marcelo Rivolta have successfully transplanted human embryonic stem cell-derived auditory nerve cells to treat hearing loss in a gerbil model. The animals were treated with a chemical that damaged auditory nerves but not hair cells. 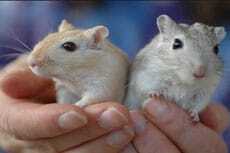 With this stem cell therapy, the gerbils were able to detect faint sounds and demonstrated overall improved hearing. Scientists hope that these advances could lead to eventual hearing-loss treatments in humans.